Temuco (Agenzia Fides) - The Catholic Mapuche are waiting for Pope Francis "to bless us, to strengthen our faith". They hope his homilies will favor "social peace". But they do not expect political solutions from him to solve all the problems, because he "is a pastor, not the President of Chile and not even a minister with special powers". This was reported to Agenzia Fides by Isolde Reuque Paillalef, executive secretary for the "Mapuche pastoral" commission of the Chilean diocese of Temuco. "The Pope" - adds Isolde, in a conversation with Agenzia Fides "will tell us what he says in other parts of the world, with an emphasis on the expectations and problems of the indigenous peoples. It will then be up to politicians to know how to listen to him, and this is especially true of those who occupy positions of power in Chile and control social development". In recent years the "question" of the Mapuches - the "children of the earth", natives of the areas in the center and in the south of Chile and Argentina, of which they feel usurped - has been related by the media mainly to violence and blazes of evangelical and Catholic churches committed by groups that claimed to act on behalf of the indigenous "cause". "In reality", notes Isolde, "we do not know who the perpetrators of these violent acts are, because justice in Chile has not identified them, and therefore we can not blame anyone. Many think that they are not really people of our people, they are not the Mapuche, but people who come from outside to create turmoil and to put the blame on the Mapuche. In any case - adds Isolde - the perpetrators of violence are few and isolated. Once identified, they should certainly be punished, but there must be proof of their crimes, because we have also seen the Mapuche accused, arrested and then released, for lack of real evidence. As Catholics - continues Isolde - we must pray so that the authors of these gestures are aware of the evil that they commit towards the Mapuche people: the churches and chapels are ours, the people built them, and by burning them no harm is done to the so-called "Hierarchical Church" or who knows what power. It only hurts the people". The spotlight on fires and violence risks to veil the intense community life of the Mapuche Christians, who above all expect to be confirmed in faith by the Successor of Peter. "There is no possible contradiction between being Mapuche and being a Christian. I would almost say that there is a complementarity between the Christian faith and the Mapuche religiosity, all based on the recognition that God is the creator of all things, and that love for God is combined with love for the earth and for nature". The Masses, celebrated in the Mapuzugun idiom, are characterized by spontaneous prayers, of a charismatic type, "where one asks God for forgiveness and permission to begin to pray, and then ones love and requests for everyday life are expressed". 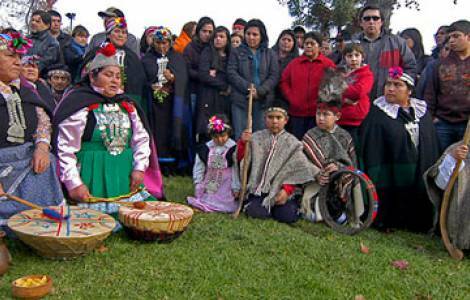 The Mapuche Catholic communities nurture a particular devotion for Ceferino Nunancura - the lay Salesian of Mapuche origin, beatified in November 2007 - and for Saint Sebastiano. During the "month of Mary", from 8 November to 8 December, acts of Marian devotion are intertwined with the daily life of community life, and the gestures performed by Mary are repeated in houses and chapels, such as the visit to her cousin Elizabeth. In view of the arrival of the Successor of Peter, the parishes also organized meetings on the life of Pope Francis, and on his experiences as a priest and Bishop in neighboring Argentina. "We feel that Pope Francis is close to us, and with his words he urges us to move forward, not to remain static", explains Isolde Reuque to Fides. Pope Francis’ visit is desired as a continuation of a path of ecclesial discernment on the "Mapuche question" that had a qualifying passage in the Pastoral Letter on the proclamation of the Gospel to the Mapuche people, published in 1979 by the Chilean Bishops of the south. "With that document" recalls Isolde Reuque "the Church reaffirmed the existence and dignity of our people". That text inspired the most important steps of the pastoral care addressed to the Mapuche, the ecclesial support to social organizations and the formation of community leaders, the rediscovery of their traditions and their history. The local Church, even in recent initiatives aimed at the Mapuche, insists on the prospect of "good life", of "living well", in balance with nature, which appears to be connatural to the spirituality of that people. This perspective also refers to the calls to overcome social tensions and conflicting pressures that mark the region of Auracana. "The message of 'good life' " underlines Isolde "is also received through the homilies and encyclicals of Pope Francis: on the custody of the common home, it has been of great impact among us, precisely because it has drawn attention to the relationship between people and nature, which is at the center of the Mapuche's spirituality and culture". According to the executive secretary of the Mapuche pastoral ministry of the diocese of Temuco, in recent times there are fewer Catholic priests who have been willing to live their priestly vocation at the service of the indigenous people of Auracanìa: "the formation they receive does not help them understand the cosmovision of the Mapuche people. Many young priests do not accept formulas and rites adapted to the Mapuche spirituality. These cultural obstacles are being overcome slowly, but a lot to work needs to be done, there is a willingness to learn the language and to acquire the criteria of interculturality, to help the Mapuche to live their faith according to their expressive forms". There are three priests from the Mapuche people in the diocese of Tomuco, and according to Isolde Reuque, "until now they have not expressed any problems" with respect to the rule of priestly celibacy.